The Grove - 2-Channel Inductive Sensor is based on Texas Instruments(TI) LDC1612, a 28-bit inductance to digital converter(LDC) for inductive sensing solutions. 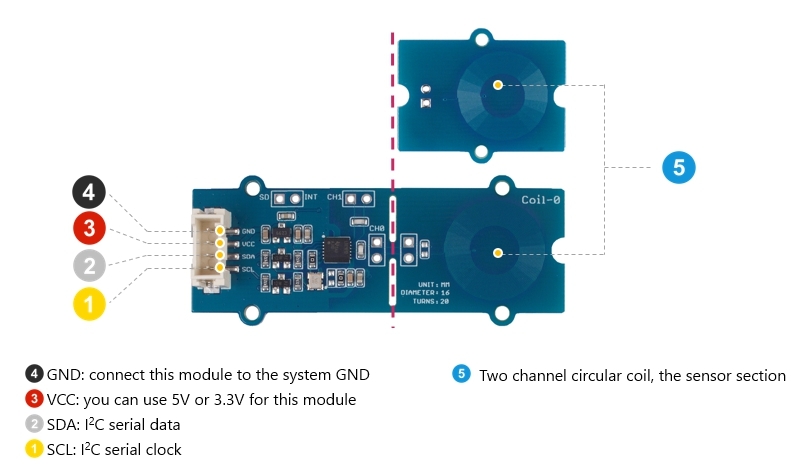 With multiple channels and support for remote sensing, the LDC1612 enables the performance and reliability benefits of inductive sensing to be realized at minimal cost and power. Inductance is an effect caused by the magnetic field of a current-carrying conductor acting back on the conductor. So by sensing the inductance, this sensor can detect the proximity of conductors especially metal nearby. When the ADDR pin is set low, the LDC I2C address is 0x2A; when the ADDR pin is set high, the LDC I2C address is 0x2B. 1. Set the Rb(resistance unit-kom), L(inductance unit-uH), C(capacitance unit-pf) by the APIs if you don't use the Coil Inductance we provided. Used to calculate and set the corresponding frequency register of the sensor. 2. 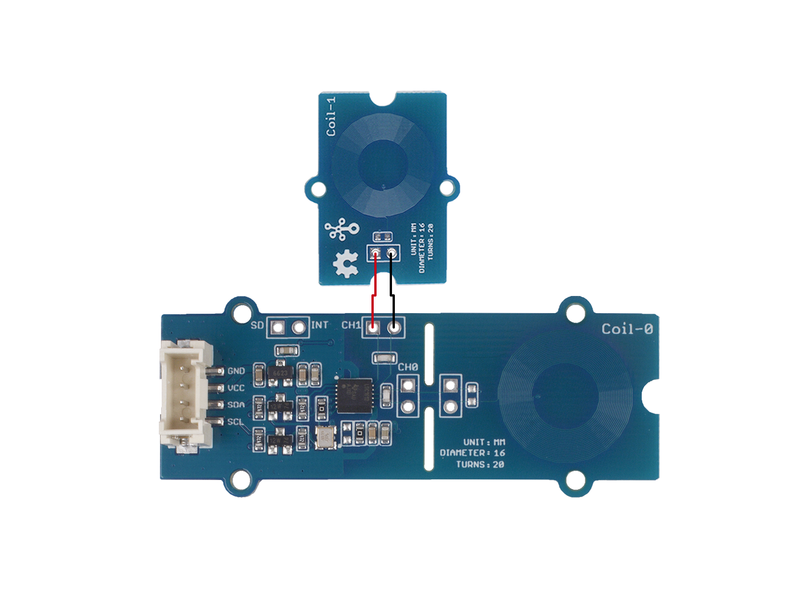 There is an INT-pad on the sensor board, It turns to the low level when the conversion is complete, overwise stays high, but you should configure the corresponding register of the sensor. LDC1612 works based on measuring the parameters of the LC oscillator, formed by the PCB copper trace and the capacitor. LDC1612 is able to measure the amount of energy it needs to provide to maintain the LC oscillation when a conductive object which is magnetically coupled with the LC oscillator approach. As the power loss of the oscillator circuit is proportional to the impedance of the conducting object, and the impedance value is affected by the distance of the object, it can then be used to determine the distance between the object and the LC oscillator. In this case, the PCB copper trace can be seen as an impedance sensor. 1 Please plug the USB cable gently, otherwise you may damage the port. Please use the USB cable with 4 wires inside, the 2 wires cable can't transfer data. If you are not sure about the wire you have, you can click here to buy. Step 1. 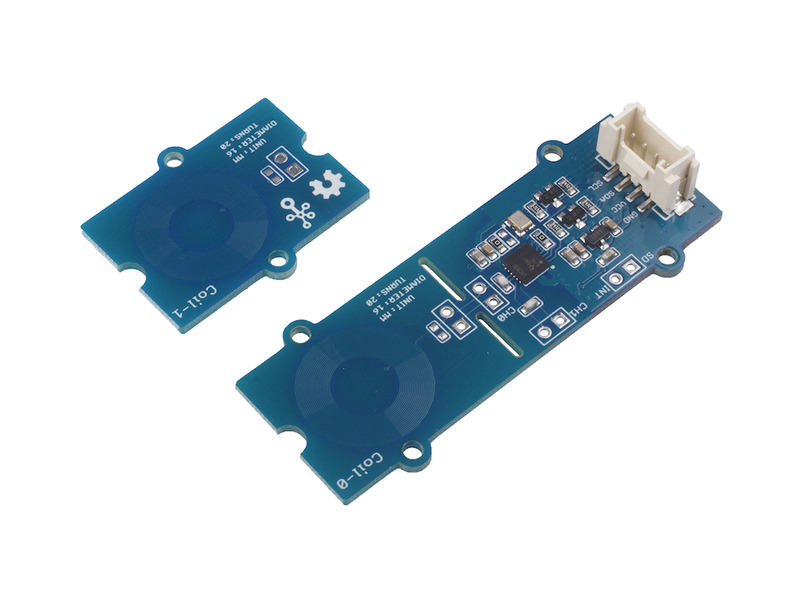 Connect the Grove - 2-Channel Inductive Sensor(LDC1612) to port I2C of Grove-Base Shield. Now, we will demonstrate you how to run the code for coin distance detection, similar procedure if you wish to run other programs. Step 1. 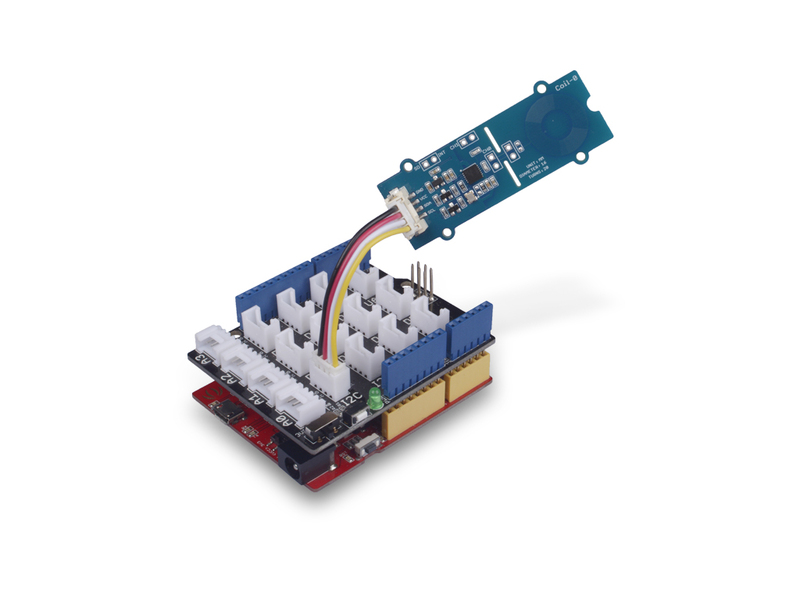 Download the Grove-2-Channel_Inductive_Sensor-LDC1612 Library from Github. 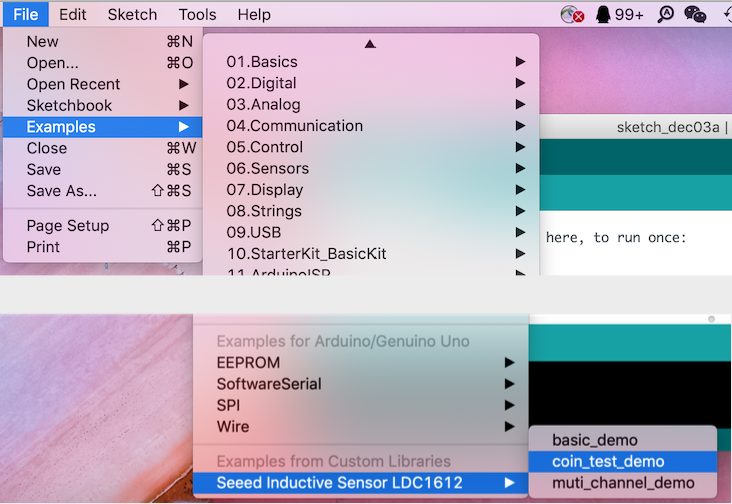 Open it directly in the Arduino IDE via the path: File → Examples →Seeed Inductive Sensor LDC1612→ coin_test_demo. Open it in your computer by click the basic_demo.ino which you can find in the folder XXXX\Arduino\libraries\examples\coin_test_demo\coin_test_demo.ino, XXXX is the location you installed the Arduino IDE. Or, you can just click the icon in upper right corner of the code block to copy the following code into a new sketch in the Arduino IDE. Coin demo This program allows user to detect the distance from the coin to the copper trace. /*Test the distance between the coin and the sensor. Note that the accuracy is for reference only. There is no coin here! This example shows multiple channels measurement and note LDC1612 support two channels. can't detect coil Coil Inductance!!! 17:04:41.098 -> can't detect coil Coil Inductance!!! 17:04:45.090 -> can't detect coil Coil Inductance!!! In basic_demo and muti_channel_demo examples, you may keep in mind that each output is corresponding to the intensity of inductance. There is the functional relationship between the output and the intensity of inductance, if you are interested in further information, you may want to refer to Datasheet LDC1612 provided by Texas Instrument(TI). Please do not hesitate to submit the issue into our forum or drop mail to techsupport@seeed.cc.